Free museum Days in Greece : Greece, being so rich in history and culture, not surprisingly has some of the best museums in the world! Below are dates and days with free admission to museums and archaelogical sites in Greece! Cause of recent plane noise : Starting on March 27th, an 11 day international Air Force training exercise has created an unusual amount of plane noise in Mani. 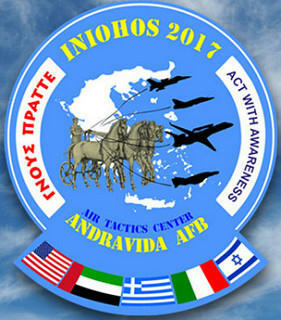 Pilots from Israel and the United Arab Emirates have been flying alongside one another as part of a Greek air force training exercise. 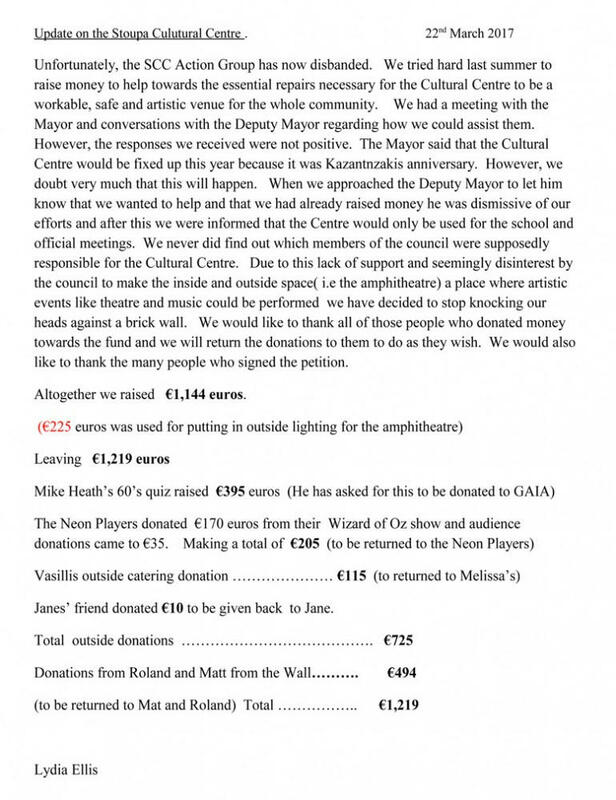 Message from Peter & Linda:- Thank you to all who came to Pidima on April 12th, to take part in the Dance of the Poor People . Fifty odd people turned up at the shoot, which was exactly right; more would have made it a bit unwieldy. We should have finished the whole project within a few month, with luck. DANCE OF THE POOR PEOPLE There is still the music to do and another scene, hopefully at Ancient Messini. Chris Spybey and Sue Lilley have been feeding and caring for the cats of this colony, on their own since 2010. 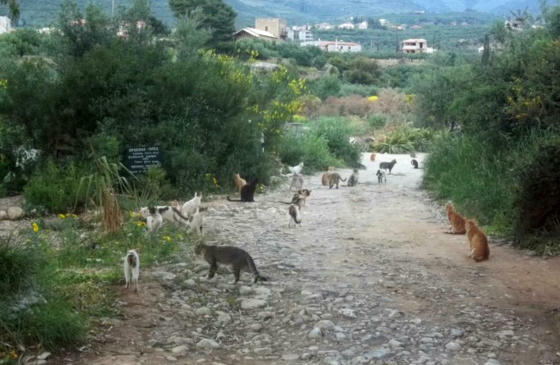 What began as 12 cats has now grown to around 40 following the September 2016 super storm and numerous people just dropping off cats and kittens. Can you please help them either by dropping off unopened cans of food, on a regular basis (Chris and Sue are there AM and PM every day), or by making a money donation to MIAO specifying that it is earmarked for the Pantazi cats. As part of the conference "Non-Ionizing Radiation Protection and Potential Impact of Health** ", organized under the auspices of KEDE Dr. Theodore Metsis, mechanical electrician, Environmental engineer, said, according to a report in the "Daily" that research institutions, academics and notable scientists warn that with the radiation levels recorded today, within the urban fabric, it is not safe to add new applications, The 5G technology and smart meters replacing analog electric meters etc, will increase the radiation affecting our daily lives. "The health effects from the radiation from wireless technology, include increased risk for cancer, cellular stress, increase of harmful free radicals, genetic damage, structural and functional changes in the reproductive system, disorders of learning and memory functions. Also, direct impact in the form of headaches, lack of concentration, insomnia, memory disorders, reduced immune system, allergies, etc. are daily symptoms from staying close to the antenna, " said Loukas Margaritis, Professor of Radiobiology, Faculty of Biology, University of Athens. "The State shall take the necessary measures to protect their citizens, following the example of other countries where the framework has become more stringent," said the president of ISA George Patoulis while adding that " every user of these devices should comply with the standards of protection, and limit exposure. " From May 1st the afternoon clinics in Kalamata Hospital will start, following a decision recently taken by the Governing Council of the institution. They will operate once a week, on Wednesdays, and the opening hours will be from 15:00 to 20:00. Afternoon clinics will begin to operate with 11 doctors, 11 nurses and 5 administrative and other staff. An appointment for these clinics can be made via the phone number 14500. April 7th: Children from the SOS Children's Villages visit temporary home for strays Of particular importance is the visit that will be made by children from SOS Children's Villages in the afternoon of 7 th April to the temporary place for strays in Messina. The Lilliputians visitors will have the opportunity to play with the puppies being cared for there, having just a need for play and interaction with people. Children will thus have an experiential contact with the animal, a symbol of love and devotion without self-interest, will tour the area with carers and will learn how to be the the ideal animal lovers themselves and future protectors of the rights of our four legged friends. Painting Competition to highlight the Penny Marathon in the summer For the third summer Messinia will host the Penny Marathon in July, with races and cycling held simultaneously in several Greek cities and in Australia to inform and raise awareness about the issue of strays. A children's painting competition has been held to highlight the project. The best will grace this year's shirts for the event It is open to elementary school children who are invited to show off the event and its purpose. 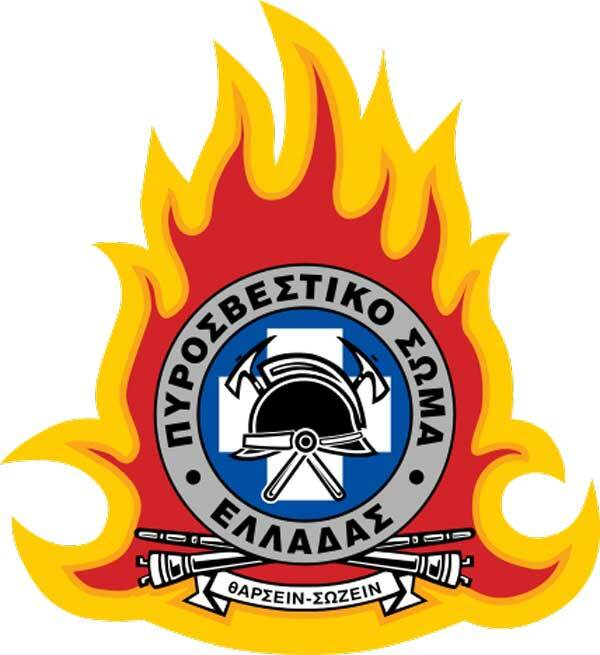 'They Did it' in Ag Nikolaos on April 2nd! 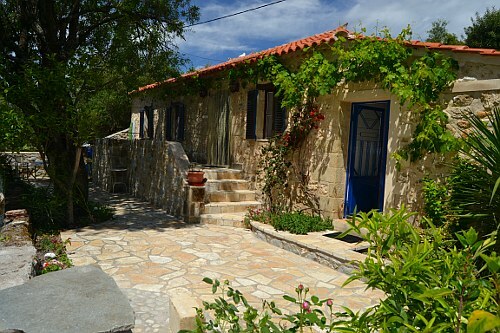 Zorbas the Greek - Local history or myth? While Stephan Bartholomä (Zorbas Travel) was working on the documentation for a German radio station, he discovered some local history. Myth destroyed:The simple wooden lodge, in which the author Kazantzakis, actually spent a lot of time, was not on the rocks to the right of Kalogria beach close to the 'Prinkipas' spring, but about in the center of the beach below the high cliff and got completely destroyed in an earthquake in 1926 by a huge boulder. Myth confirmed: At the time, a widow did live with her children in the house 'Sourmelina'**. And most likely, this woman inspired Kazantzakis to create the figure of the beautiful widow in the novel! Will you have a working phone when there is a power cut? COSMOTE and other phone companies are phasing out traditional plug-in landlines, and replacing them with VOIP systems (Voice over IP) This means that even if you have a corded phone, it will NOT work if there is a power cut. If you wish to find out if your land line will work during a power cut, please ring Cosmote customer services 13888 (They have a very good service in English) For more general information see Will your landline telephone work during a power cut? 'A Taste of Home' deliveries : Following requests, Gary did a trial delivery to Petalidi on March 17th, but has decided it is not worth continuing at the moment. However, he has new customers from the area and will be meeting them in Kalamata or at the new Lidl's in Messini, in future. If he gets more customers interested, he will reconsider a regular Petalidi delivery. Air travel news: There is now a long-term car park at Kalamata airport Tips....other The number of destinations/flights from Kalamata continue to increase, with Begrade being the latest addition. snippets(4/3). Flights to Athens are increasing too, but Athens International Airport (Eleftherios Venizelos) was recently certified as carbon neutral - good news for the environment! snippets8/3 The hotel 'Pantheon' near Athens airport has lowered its prices! GAIA news : An 86 year old woman went missing on the afternoon of March 7th, in the Exochori Area. Many volunteers from Gaia have been helping with the search for many days, plus villagers, but the old lady has not been found. The search continues, and the Police are asking anyone who may have seen her to contact LIFE LINE, 24 hours a day, on the National SOS Line 1065. PICTURE. Better news is that Gaia now have a 'new' Unimog fire truck ready for action Gaia Snippets and they have just received another big delivery of donations from Germany, which includes food, medicines ans school supplies for the Gaia welfare store. A cautionary tale about home improvements: In November last year, a local resident employed a reputable Home Maintenance company to install a central heating system, but 3 months later, in desperation, because the system was still not working properly, the home owner got another company in to sort out the problems. Unfortunately the Home Maintenance company would not accept any reponsibility for the delay, or the stress and extra expense that resulted, and offered no compensation. This unfortunate case raises a general issue, that if you have any work done, even reputable companies can sometimes 'get it wrong'. As a safeguard, if possible, retain some of the payment until you are sure the work has been completed satisfactorily, and equipment is working as it should! •To cope with the excessive number of unwanted kittens MIAO is using temporary infertility injections, but it is NOT and easy/safe option! 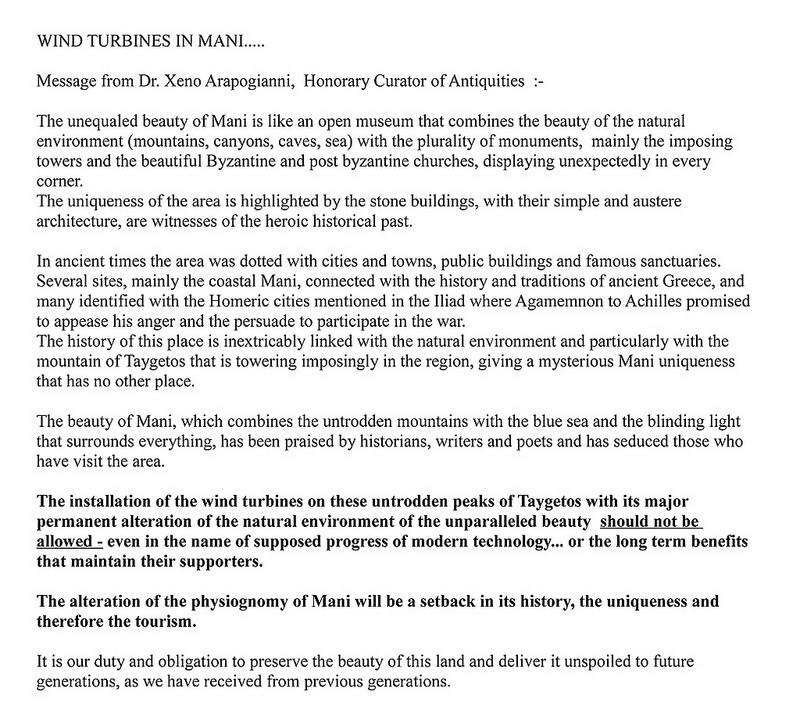 Petition to stop wind farms blighting the Mani : In November last year, Nikos Gondicas was urging residents not only of Mani but the wider region, to protest about the plans for the installation of dozens of wind turbines for electricity generation. The rush now, is because of the forthcoming revision of the subsidy scheme, resulting in a hurry to reap the maximum subsidy, and the companies that promote them have intensified their efforts to get the decisive approval to start projects.